The overall objective of the KConnect project is to create a medical text Data-Value Chain with a critical mass of participating companies using cutting-edge commercial cloud-based services for multilingual Semantic Annotation, Semantic Search and Machine Translation of Electronic Health Records and medical publications. The commercial cloud-based services will be the result of productisation of the multilingual medical text processing tools developed in the Khresmoi FP7 project, allowing wide adoption of these tools by industry. The critical mass will be created by the KConnect Professional Services Community, made up of companies trained to build solutions based on the KConnect Services. The KConnect project will facilitate the straightforward adaptation of the commercialised services to new languages by providing toolkits enabling the adaptation to be done by people having a software engineering skillset, as opposed to the rarer language engineering skillset. The KConnect services will also be adapted to handle text in Electronic Health Records, which is particularly challenging due to misspellings, neologisms, organisation-specific acronyms, and heavy use of negation and hedging. Four SMEs in the consortium will build solutions for their customers based on KConnect technology. Two partners from the medical domain will use KConnect services to solve their medical record analysis challenges. 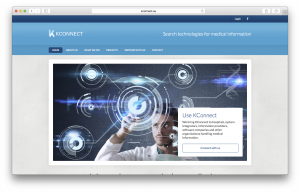 Two highly-used medical search portal providers will implement the KConnect services to innovate the services offered by their search portals. For more information please visit www.kconnect.eu. This project has received funding from the European Union’s Horizon 2020 research and innovation programme under grant agreement no. 644753.